The Oghma Infinium is an ancient tome of knowledge, and an artifact of great power. It was written by Xarxes, the scribe of Auri-El, who had been granted the knowledge within by Hermaeus Mora. 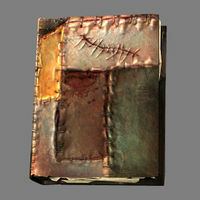 The name of the tome comes from Oghma, the wife of Xarxes, whom he created from his favorite moments in history. The knowledge within the tome grants the reader access to the artifact's energy, which can be manipulated to achieve near demi-god abilities. The Paths of Steel, Shadow and Spirit are the three main sections of the tome. Once the Oghma Infinium is used, it disappears from its owner's possession. Through the reading of Black Books, individuals can obtain much more power than that gained from the Oghma Infinium alone. After the fall of their empire in the early First Era, many Ayleid tribes fled Cyrodiil to resettle in Valenwood. One such Ayleid settlement was located just across the border, on the southern banks of the Strid River in the Northern Woods of Valenwood, west of modern Arenthia. These worshippers of Auri-El had come into possession of two dangerous tomes of knowledge: the Oghma Infinium and the Book of the Frozen Legion. They attempted to learn the secrets contained within, but instead their city collapsed into an underground cavern, now only known as the "swallowed city". Following the gradual absorption of Ayleids into Bosmer society, the Bosmer descendants of the lost city attempted to rebuild. This new settlement was in existence until 2E 582, when Javad Tharn and his Colovian forces invaded Reaper's March. One of his generals, an Imperial named Graccus, commandeered a large invasion force and burned the Bosmer city to the ground, building a mansion over the ruins. This mansion, which came to be known as the Vile Manse, was used by Graccus as a staging ground for exploring the subterranean tunnels in search of the Oghma Infinium. Upon finding the tome, Graccus managed to survive the "cosmic ululation", while also summoning powerful Daedra to guard the ruins. The Book of the Frozen Legion also summoned several Frost Atronachs, freezing many Bosmer and transforming some into icy undead. Graccus was determined to use the Oghma Infinium to aid the invasion and allow the Empire to crush the Aldmeri Dominion. However, Javad withdrew military support once he learned of Graccus' apparent inactivity, and Hermaeus Mora decided that he was not worthy to continue possessing the tome. The Soulless One then entered the Vile Manse, and Mora promised the Oghma Infinium as a reward for defeating Graccus. However, the Prince was not willing to risk the Soulless One against the tome's secrets, and snatched it away upon Graccus' death. It was duly returned it to its home in Apocrypha, and the Discourse Amaranthine was offered in its stead. The tome was uncovered during the Imperial Simulacrum by the Eternal Champion, although conflicting reports place its discovery in either Skyrim or Elsweyr. Just before the events of the Warp in the West, an unknown agent of the Blades in the Iliac Bay area was sent by Hermaeus Mora to assassinate a noble who had displeased the Prince. In return, Mora promised the Oghma Infinium, which was in the possession of one of his worshippers. The agent succeeded, and the tome passed hands. In 3E 433, Mora again offered the tome as a reward, this time to the Champion of Cyrodiil. Mora summoned the Champion to his shrine in the Jerall Mountains, on the border with Skyrim, after seeing how capable the Champion was with dealing with the other Daedric Princes. Mora had the Champion collect souls from the ten main races of Tamriel, which were needed by his followers to perform a divination. The Champion succeeded and was given the tome. Sometime after the events of the Third Era, the tome was sealed inside an ancient Dwemer lockbox so that no more of its dangerous knowledge could be shared with mortals. This displeased Hermaeus Mora. The lockbox, located in a small cave out on the ice sheets off the coast of northeast Skyrim, was massive in size and seemingly bigger on the inside than physically possible. It could only be opened by those of Dwarven blood. A follower of Hermaeus Mora, Septimus Signus, was manipulated by the god and tasked with opening the lockbox. Signus believed the lockbox contained the Heart of Lorkhan. Signus was told by Mora that he would need the knowledge of an Elder Scroll to divine the way to open the lockbox. Signus was an expert on Elder Scrolls, and when the Last Dragonborn came looking for one in 4E 201, Signus pointed them towards Blackreach. The Last Dragonborn found the Elder Scroll within the Tower of Mzark, taking it and inscribing its knowledge onto a blank Dwemer lexicon. Signus used the knowledge to discover how to open the lockbox. As the Dwemer were all but extinct, Signus theorized that he could inject himself with the blood of all surviving elves to trick the lock. Mora then appeared to the Dragonborn in the form of a Wretched Abyss and revealed that Signus was no longer of use to him due to his broken mind. The Dragonborn retrieved samples of blood from Altmer, Bosmer, Dunmer, Falmer and Orcs. Signus succeeded in opening the lock, only to discover that it contained the Oghma Infinium. He was turned to dust attempting to read it. The Last Dragonborn took the tome and was contacted by Mora, who was pleased that his knowledge would again be put to use. The Orb of Vaermina, named for its patron, was an orb apparently used for scrying. At some point before 3E 433, it was in the possession of a wizard named Arkved, by whom it was apparently "snatched from the dreams of [Vaermina's] followers".. It was recovered by Vaermina's champion, who received the Skull of Corruption in return. According to the Moth Priest Kellen, the Orb was used by Lord Naarafin—then in the service of Boethiah—to spy on Titus Mede II and his armies. It was recovered by the Forgotten Hero from the Emperor's chambers, who either destroyed or kept it. This page was last modified on 1 September 2018, at 17:31.